It is Naushad’s death anniversary today and ofcourse attempts are being made all over the country to relive the evergreen hits of the 40’s to 60’s. The man started his music career with the movie Prem Nagar followed with Darshan and Mela. The initial years focused greatly on making his career a strong one. He won his first Filmfare for the movie Baiju Bawra. Naushad Ali is one of the few Music directors to have won the prestigious ‘Dada Saheb Plhalke Award’ , which as everyone knows is one of the most prestigious Awards given to the greatest contributors. With most of the movies that he composed music for reaching the silver jubilee celebrations, we get to understand the kind of worth his work carries. Few examples would include movies like Sharda, Kaanoon, Namaste, Sajong. One popular classic film that remains fresh in everyone’s memory would ofcourse be the movie ‘Mughal-e-Azam’. A wonderfully made one, this film had utmost grandeur and ofcourse won the hearts of many people. One of the movies that holds a lot of value in the Bollywood industry. Pakzeezah has reached the penultimate status of having the tag of being one of the movies with those few movies reaching up to the golden jubilee status. Naushad with his presence in the industry for so many years has worked with an array of directors and also ofcourse been the reason behind many actors doing their stints in those famous songs. Rajesh Khanna – Naushad ofcourse were one of the best music director- actor combo’s we have ever witnessed in bollywood. Not many are aware that there is an Award given to deserving candidates in the film industry with the Naushad Award. 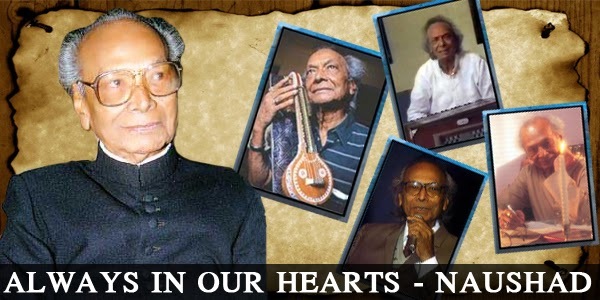 A legend who passed away a few years back, Naushad remains in our hearts forever.